Note 1/10/12: While the description here still represents the basic logic behind my method, I have since adopted a new condensed version of the graphics in order to increase information density, as well as a new method of illustrating the distribution of the Diesis. See the other two pages of this section. The heart of the graphic method is the lower trace, which is simply a standard Deviation from Equal Temperament plot. This is not due to any deference to ET as a superior system, but only an indication of the fact that either by design or by default the chain of fifths must always return to the same note from which it started, which can be neither higher nor lower than it initially was. As the name of this blog implies, this note is C, and it is therefore the only note of the system which cannot be moved. Small red and green vectors emanating from each note are indications of “normal” limits of fifth tempering, and the position of each note in reference to the ends of these two lines indicates the amount of tempering borne by the fifth. Red indicats pure fifths, and green indicates 1/4 meantone fifths. If each successive note is placed at the end of the red line emanating from the note to the left of it, the result will be a series of pure fifths. The general pitch level will rise, causing the major third to be too high after a chain of four fifths, and if the series is continued, it will end much too high to return smoothly to the final C.
On the other hand, if each successive note is placed at the end of the green line emanating from the note to the left of it, a series of tempered narrow fifths is created. After a series of four of these narrow fifths, the general level has descended sufficiently to result in a pure major third. However, following this green vector consistently causes the general pitch level to drop so much that the end of the series is much too low to return smoothly to the final C.
Notes can be and often were placed outside of these “limits”, that is, above the red line (wider than pure) or below the green line (tempered by more than 1/4 Syntonic comma), but one does so with caution. There is much more freedom in the placement of notes above the red line, i.e. wide fifths, since a fifth which is too wide by a given amount sounds exactly the same as a fifth too narrow by by the same amount. For example, a fifth which is wider than pure by 1/4 comma would be represented by a position which is as high above the end of the red line as the end of the green line is below it. This position can more or less be taken as the maximum for a tolerable wide fifth. Such wide fifths can be observed in the various “mollified meantone” temperaments as well as the circulating temperaments IV and V of Werckmeister. Hard information is given on the basic trace, both the cents deviation from Equal for programing tuning devices or synthesizers, and the amount of fifth tempering (whenever quantifiable) for those who like to think in those terms. The two different commas are indicated by the letters P and S. Plus or minus signs before the fraction indicate that the fifth is wide or narrow of pure, respectively, while plus or minus signs after the fraction indicate that the tempering is slightly more or less than the amount indicated. 1. The pure third reference line, blue for minor and green for major. Since the distance above any given note where one finds a pure minor or major third is a constant, the line indicating the relative positions where pure thirds are found must run parallel with the lower deviation trace, no matter what its shape. 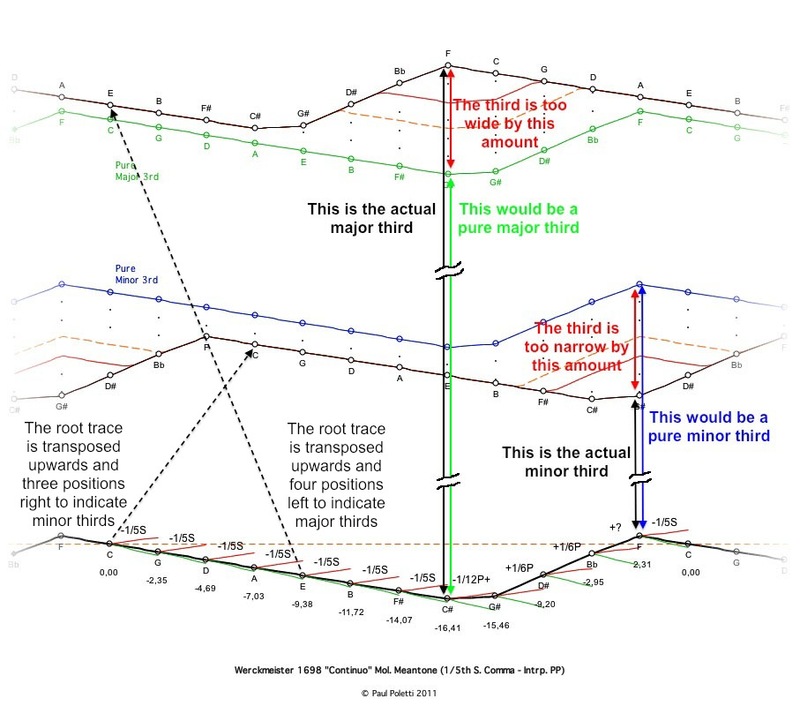 Note: the root note names are reproduced just below the green trace for pure major thirds in order to make it easier to identify the interval. The points on the green trace itself indicate the same notes as indicated in black just above the major third deviation trace. 2. The deviation trace for the upper notes of each interval. The distance between this trace and the pure third trace is caused by the cumulative displacement of both notes which make the interval. If the note is below the pure third trace, it is too low and therefore too close to the root note, i.e. the interval is too narrow, and if it is above the pure third trace, it is too high and too far from the root note, i.e. the interval is too wide. It is absolutely essential to realize that these upper note deviation traces are formed simply by transposing the basic root note deviation trace upward and sideways, three notes right for minor thirds and four notes left for the major thirds. This literal copying of the lower trace illustrates how temperaments work; individual notes are placed higher or lower to produce certain results when this position of the note is recombined with those of other notes in various harmonic relationships, the other notes themselves also having been positioned higher or lower. 3. Qualitative guide lines. Wherever there is a significant amount of distance between the pure third and devaition third lines deviate, reference indicators appear. A series of dots represent vertical distances of 1/4 of a syntonic comma, an orange dashed line indicates an Equal Tempered major or minor third and a red solid line the size of the interval in Pythagorean Tuning. Note: the scale of each deviation trace is not the same as the overall scale separating the three traces, as indicated by the interruptions in the vertical arrows. If everything were to be graphed at a constant scale, the deviations themselves would be far too small to be of visual significance. Note names for accidentals change according to a global evaluation of the size of all of the various major and minor thirds containing each individual note. Three possibilities exist: (1) the note creates a better minor third looking down from a root and a better major third looking up from a root, making it a sharp; (2) the note creates a better minor third looking up and a better major third looking down, making it a flat; (3) the note creates minor and/or major thirds in both directions which are more or less equal in size, meaning that it functions equally-well (or equally-poorly is closer to the truth) as both a sharp and a flat. When there is a conflict between the evaluation based on minor and major thirds, a slight preference is given to the quality of major thirds. Note that all traces fade away in the mists of infinite circularity rather than simply starting and stopping at the note C. This is to remind us that even though we conceive of the system as commencing and ending with the generating note, the musical reality of the final structure is nonetheless circular, and the way in which the harmonic landscape appears to us depends on our point of view. In its fully-functional dynamic version, the graph can be moved at will left or right to view the harmonic surroundings from any note. Unfortunately, I cannot incorporate this feature on the web pages found here.